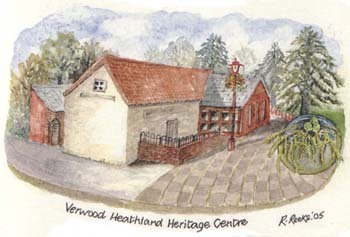 When World War started I was 16 years old and living in the then Village of Verwood in Dorset . I remember the blackout when no lights were allowed and all windows had to be blacked out. If a light was showing through a window the Air Raid Warden or his messenger would knock the door and demand that we "PUT THOSE LIGHTS OUT'. No lights were allowed on our bicycles or cars although not many people owned cars. I worked in a local grocery store where I was in a "reserved occupation" (which meant that I could not move to another job). It was my job to control incoming and outgoing food coupons. I collected and counted the food coupons exchanged by our customers when they bought food from us, and forward them to the local food office which then issued us with paperwork so that we could purchase more stock. Our customers came from the village of Verwood and our delivery vans visited the villages of Three Legged Cross, Horton, Woodlands and Edmondsham. Rationed foodstuffs in our grocery shop included - bacon - sugar - cheese - tea - butter - eggs - marg - lard and preserves. Ration books of coupons were issued for each person and the above foods could only be purchased by handing over coupons (as well as the cash!). We lived in the country and kept chickens, so we had our own eggs, but chicken food was rationed! Other items rationed included clothes, fuel and meat. My job also included bookkeeping and balancing the cash and accounts - I often also helped with putting up orders for delivery. We were always short staffed because employees were being called up all the time. After normal working hours I was an Air Raid Warden Messenger and had to deliver messages whenever asked. On one occasion I had to cycle (with no lights) in the pitch black to fetch a doctor to attend a child involved in a fatal bombing. I frequently had to cycle across the common (over some very rough ground). On another occasion I tried to report sick but the Warden insisted that I must still be ready for duty - illness was no excuse! One scary time was when bombs dropped in Verwood and the gorse/heather all around Stephens Castle was alight. The Germans dropped bombs called Molatov cocktails - a large bomb which opened up showering a lot of fire-bombs. Another time, bombs were dropped near the Church - all services were held at the Vicarage until the Army gave the all clear.